Today we're excited to chat with Amanda Marin author of North To Nara. Read on for more about Amanda, plus an excerpt and an giveaway! Amanda holds degrees in English from Salve Regina University and Boston College. Her favorite things include Starbucks lattes, lazy summer afternoons at the beach, and books with characters that make you go "awwww." She lives in New Hampshire with her family and furbaby, Snickers the Poodle. Definitely the novel! 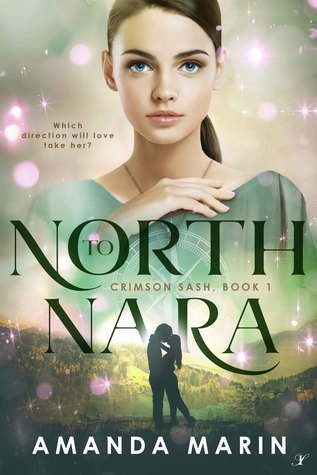 I really struggled with titles and went through about 10 before I settled on North to Nara—fortunately, my publisher agreed it was the strongest on my list. The title comes from a conversation between Neve and Micah about where they can go where their forbidden romance won’t be… well, forbidden. I’m definitely proudest of the scene that inspired the book’s title. In it, Neve and Micah are chatting in a park, trying to sort out how (and where) they can possibly be together. The scene was a total train wreck in my first draft (you’ll have to take my word on that, because no one is ever seeing it!). I kept reworking it, though, and now it’s one of my faves—partly because I didn’t let it best me. What do you like most about the cover of the book? Working with the cover designer—the fabulously talented and patient Najla Qamber—was a really fun and collaborative journey. We went through some exciting and dramatic changes with it, so the creative process as a whole—not just one element of the cover—was what I liked best about it. Naj worked wonders when it came to bringing the images in my head to life! What’s up next for you? I’m finishing up the sequel for North to Nara. It’s called Sky to Sea and is expected out in January 2020. The sequel is very personal to me—I put a lot of emotion into it, and it’s once again filled with romance, suspense, and adventure. The first few pages of Sky to Sea appear at the end of North to Nara—I’m keeping quiet beyond that so as not to spoil either book! Which part of the writing process do you enjoy more: Drafting or Revising? Definitely drafting! I love the freedom of just being able to get ideas down on the page without worrying too much about whether each word or scene is perfect. It’s exciting to simply go where the characters take you. Refining can come after. When writing North to Nara, I did some pretty extensive overhauls, but the nuts and bolts of the story stayed the same. I’m not sure I actually have a superpower (though I hope some readers will think I’m good at writing a thought-provoking but totally swoon-worthy YA dystopian romance!). But if I was able to pick a superpower, I’d go with having the ability to manipulate time—go forward or backward, relive your favorite moments whenever you want or fix your mistakes. As long as it could be free from negative side effects, count me in! I love animals and am dog-momma to the world’s gentlest toy poodle, Snickers (who may or may not be the living definition of “pampered pooch”!). I donate regularly to ASPCA and local animal shelters—it’s important to me to help those who have no voice, including animals. Frantically, I glance around the darkened street, trying to think of something to say to postpone our inevitable goodbye. Each second that passes is like wind blowing through my fingers—impossible to hold on to no matter how hard I try. But if I only have a few moments left with Micah, I want him to know that I’ve appreciated him—that someone has cared about him, despite the lonely laws of the Suffering. As I look at Micah, I try to remember everything about him. The angle of his jaw. The persistent stubble on his chin. The wildness of his hair. After tonight, I may never see him again—and if I do, he’ll look older, more tired and weak from carrying others’ troubles. In time, I may not even recognize him. Realizing this, I reach up to touch his cheek, to help me map the way he looks right now, tonight, in my mind. Micah doesn’t pull away or try to stop me, but he seems uncomfortable anyway, like he’s hurting somehow. His voice is little more than a strained whisper, and as I look at him, I’m sure he feels the same reluctance tugging at him that I do, so I decide to take a chance. “I’m not ready to give you up, Micah,” I murmur.